535-NMCBT-16 Features: -Extreme pressure lubricant formulated to assure absolute parts protection against seizure, galling and corrosion in fresh and salt water environments. -Offers unparalleled resistance to water washout and the best protection in continuous high moisture environments both above and below water lines. -Packing Type: Brush Top Can. -Temp. Range: -297.0 °F [Min], 2450.0 °F [Max]. Dimensions: Overall Product Weight: -0.67 Pounds. 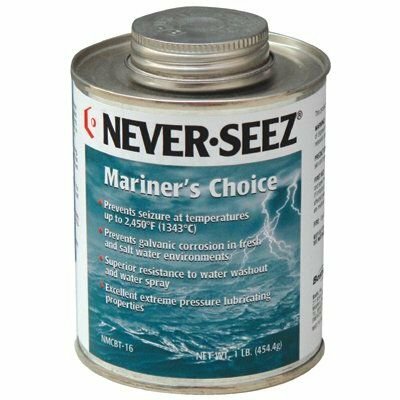 Never-Seez Mariner's Choice prevents rust, galling, and galvanic corrosion in salt water, salt, air, and high-moisture environments. Specially formulated for wet applications. This product was developed from years of experience working with marine engineers to provide superior parts protection in applications exposed to salt water. Mariner's Choice is the best choice for protection above and below the waterline without polluting the environment. If you have any questions about this product by Never-Seez, contact us by completing and submitting the form below. If you are looking for a specif part number, please include it with your message. BOSTIK NS-160 BOSTIK REGULAR COPPER GRADE ANTI-SEIZE FLAT TOP - MFR: NS-160 1 LB.